$46 for completethread kit ( attachments not included). This charming basket is a good vehicle for teaching traditional canvas applique'. It was developed as part of a larger notebook course originally, but it is an attractive design that makes a nice 1-day class by itself. Students will stitch the basket applique' itself prior to class. Students will prepare the applique' for mounting in class and then pad the ground surface before applying the basket. As this is done, I will share a variety of examples of applique' from my notebook and discuss the differences in handling each situation. In the afternoon, we will cover the "finishing touches" of the design - the braided handle, the flowers, and the open background pattern, which is an original one I developed for this design. COLOR CHOICE: Three different Watercolours for basket: Celadon (Spring), Paprika (Fall) and Shenandoah (Summer). Background and appliqué threads are coordinated with the hand-dyed thread. PREWORK: The basket applique is stitched prior to class. 1. To teach the specialized preparation and mounting techniques for applying one canvas to another to achieve raised effects. 2. 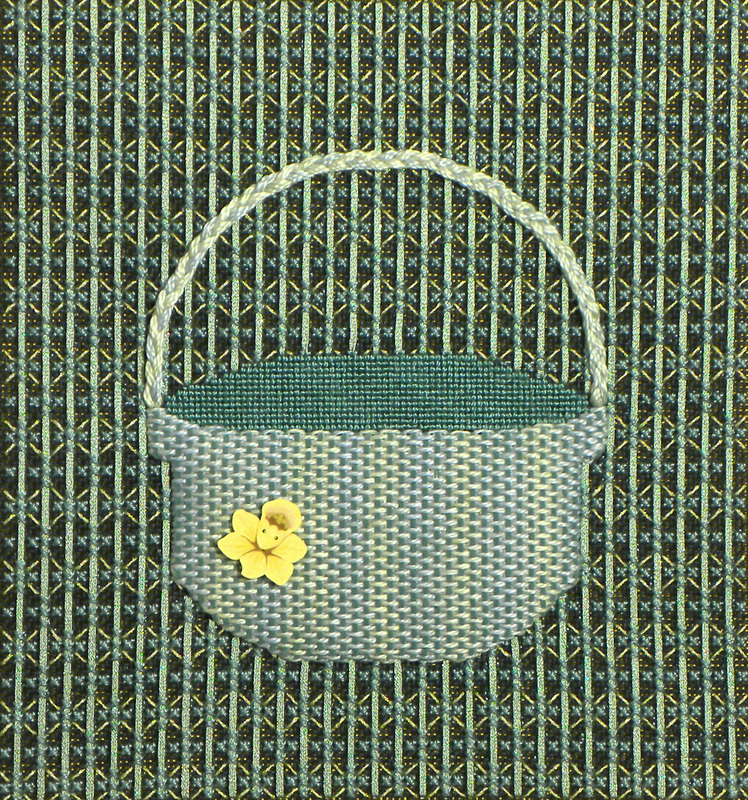 To show how the layered effects of a couching pattern can be used effectively to add an appropriate woven texture to the basket. 3. 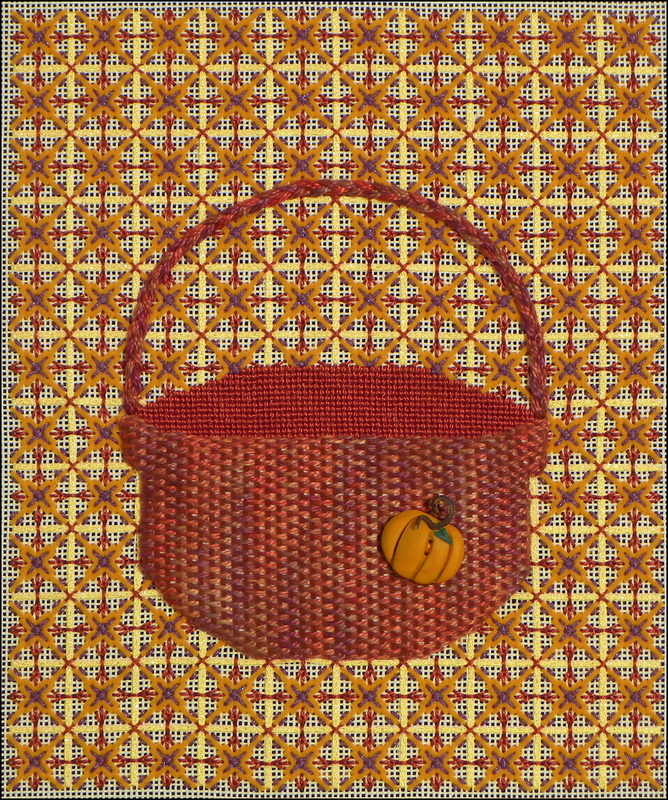 A second open couching pattern is used for the background around the basket and the sequences will demonstrate effective ways to conceal all of the traveling threads of the various steps. STUDENT PROVIDES: 12" x 12" stretcher frame, embroidery scissors, laying tool, an awl or large thumb tack for braiding the basket handle, a clamp or frame weight to secure the stretcher frame to the working table plus any other normal accessories needed to work on 18-count canvas (light, magnifier, etc. ).